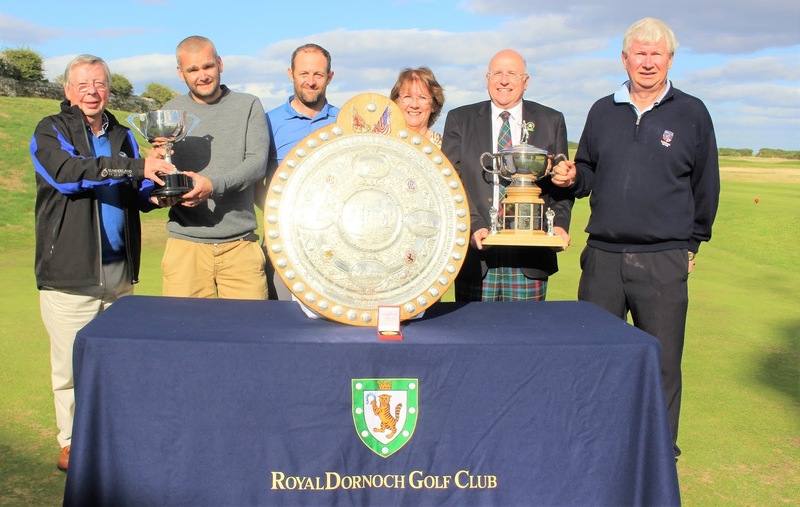 Prizewinners (left to right): Gordon Lawson (President, Royal Dornoch GC), Grant Mackay (E C Fraser Trophy), Wilma Murray (captain’s wife), Robin Murray (Royal Dornoch captain), Ian Smyth (Davidison Trophy). Picture by Robin Wilson. In a repeat of the 2009 final when he beat Ian Rennie (Hindhead) to win the tournament for the first time, local golfer Chris Mailley won the Carnegie Shield at Royal Dornoch for a fourth time today, beating the same player again in the final. Mailley (35) had the hardest route to the final, having to beat three overseas players, Dane Jorg Paulus and two Americans, Andrew Biggadike and Trey Wilkenson, but once in the final he proved the stronger player. Rennie's best scalp was former winner John Forbes in the quarter- finals and in the semi final he beat Scottish-based Australian Robbie Morrison (Royal Perth). When the local member turned into the homeward-facing wind, two powerful strikes took him to the edge of the 529yd par five ninth hole where he chipped in for eagle and regained a two-hole lead. Both missed the par three tenth green but Mailley got down in two to go three up and after finding the 11th green with a low iron he went four ahead. Another birdie from a holed bunker shot at the next par three put the local dormie ahead and he closed off the game at 6 and 4 on the next green. Reinstated Irish professional Ian Smyth (63) (Clandeboye GC, Bangor, Northern Ireland), won the first handicap division Davidson Trophy on the last green against Carluke's Alastair Dickson (21) who has just completed his final year at the UHI Dornoch College. Dickson was two up but bogeyed the last four holes to lose by one hole. Local member Grant Mackay (37), who works in a Ross-shire engineering firm, made his own putter and it brought him success in the final of the second handicap section for the E C Fraser Trophy with a 16th hole win over another another Australian visitor, David Liddicoat (The Grange Adelaide). Semi-finals – I Rennie (Hindhead) bt R Morrison (Royal Perth) 4 and 3, C Mailley (Royal Dornoch) bt A Biggadike (Olympic USA) 1 hole. Final – Mailley bt Rennie 6 and 4. Semi-finals – I Smyth (Clandeboye) bt A Botterill (Sandy Lodge) at 21st, A Dickson (Carluke) bt B Stoke (Betchworth Park) 5 and 4. Final - Smyth bt Dickson 1 hole. Semi-finals - G Mackay (Royal Dornoch) bt B Robertson (Royal Dornoch) 4 and 3, D Liddicoat (The Grange, NZ) bt K MacGillivray (Royal Dornoch) at 20th. Final - Mackay bt Liddicoat 4 and 2.